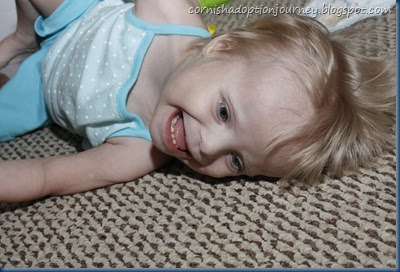 I have many photos and videos to add but am joing other moms from Reece's Rainbow in a "blog silence" in honor of Emma. Some of us are waking at 5:45am to have an online prayer group before Emma's sugery. I copied the following from another mom who explains the seriousness of this surgery. I'll try to update once I hear word. Please pray for Emma. She will be having heart surgery Monday morning. The surgery needed to be done when she was very small, but because she was in an orphanage for the first 5 years of her life, the surgery was not able to be performed. This surgery is her only chance at survival because right now her little heart is giving out quickly. Please pray for her family that they will be comforted and that God will hold them close during this time (click on her picture on the left of my blog and it will direct you to their blog). Please also pray for the doctors, that they will be able to perform this delicate operation without any complications. Please pray that Emma will be healed and live a happy and long life with her loving family.